When it comes to quality MRI equipment, Siemens has been a leading manufacturer for a long time. Their systems have a reputation for reliability and cutting edge technology- and the cost to buy them new reflects it. This is why we've found Siemens MRI systems to be so desirable on the secondary market and for interim rental in mobile imaging trailers. Among the Siemens MRI systems we've worked with- selling, renting, and covering under service agreements- their Espree model has emerged as a popular favorite for users and patients alike. 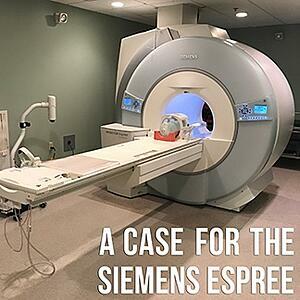 If you're in the market to buy or rent an MRI system, the following are several reasons why we think the Siemens Espree is an option well worth considering. The Siemens Espree was the first wide bore 70cm MR to hit the market. Being a few years ahead of the competition, the model is more available to buyers who want a wide-bore option, but are turning to the secondary market to make the upgrade affordable. When it comes to scanning patients who struggle with claustrophobia, obesity, or conditions that impair their movement, the Espree's bore dimensions give it an advantage over scanners with standard bore dimensions. The 70cm diameter and shorter depth of the Espree bore increase accessibility and comfort. Improvements to Siemens' software have helped increase throughput for their MRI line. The Espree is among the models that have benefited. This helps patients get in, get scanned, and get off the table as quickly as possible, creating relief for them, and more latitude in scheduling for the imaging facility. The faster scanning afforded by these software advances also increases diagnostic confidence. Less time spent in the bore reduces the likelihood of artifacts created by patient movement. Total Imaging Matrix (TIM) gives MRI technologists the ability to perform whole body scans without adjusting coils or repositioning the patient. The Espree is one of a number of Siemens systems that features TIM. This technology allows multiple coils to be daisy-chained together and used in a single scan of multiple anatomical regions, or even a patient's full body. The Espree is built around a zero boil-off magnet. Cryogen costs are minimal for the system as, with proper periodic maintenance, the refill interval can be as long as ten years. While the list of benefits above is far from encyclopedic, we hope it helps demonstrate why we love to pair MRI buyers and renters with Siemens Espree systems. If you'd like to know more about bringing an Espree to your imaging facility, whether as your next in-house magnet or on an interim rental basis, contact us with one of the buttons below to tell us how we help.